Contains slow release Nitrogen for long lasting results plus high Iron content along with other trace elements to produce super greening power. 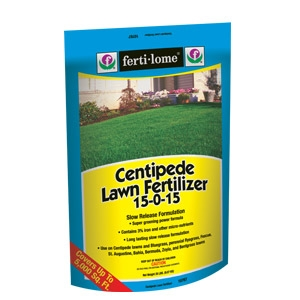 Use on Cenetipede lawns and Bluegrass, perennial Ryegrass, Fescue, St. Augustine, Bahia, Bermuda, Zoysia and Bentgrass lawns. Coverage: 5,000 sq. ft. Apply in the spring and fall. 20 lbs.